Kudos to the staff at FedDev for announcing most of the contributions for the July to September period before the quarterly disclosures were posted. The most significant not-yet-announced funding from the list is $925,000 for Dejero, made through FedDev's Investing in Business Innovation program (which means there was additional angel funding for the company as well). Angel groups across Southern Ontario are getting $100,000 this year from FedDev and GTAN received its funding in the quarter. Funding to businesses is repayble. AURP Canada is a national organization, headed by Carol Stewart at the David Johnston Research and Technology Park at UW. The Ontario Association of CFDCs is based in St. Thomas and serves all of Ontario. The Western Ontario CFDC Association covers an area that includes all of Southwestern Ontario. Also see the latest IRAP contributions. IRAP has disclosed its Q2 contributions—the period covering July, August, and September. Topping the list among recipients in Southwestern Ontario is A&L Labs in London and Communitech in Waterloo Region, with London's Quantum5X also in the six-figure range. Other recipients include Big Blue Bubble, TechAlliance, Avvasi, CrossChasm, Aeryon, IMAP, Akira, Powernoodle, Renix, Neoventures, and LifeLike Biotissue. 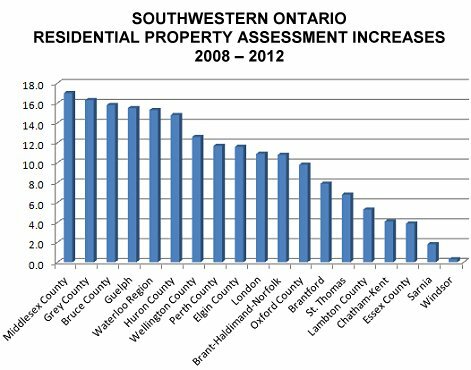 The 2012 MPAC property assessment results are all in, and all regions of Southwestern Ontario fell below the provincial average of an 18.0% increase in residential property value between 2008 and 2012. Across the region, the highest average increase was in Middlesex County—my new(ish) home—at 17.0%, followed by Grey (16.3%) and Bruce (15.8%) Counties and Guelph (15.5%), with Waterloo Region (15.3%) and Huron County (14.8%) close behind. Windsor was at the other end of the scale with a 0.3% increase, followed by Sarnia at 1.8%. 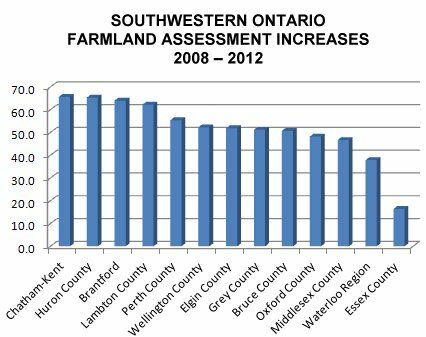 The value of farmland has skyrocketed in Southwestern Ontario over the last four years, with the biggest increases coming in Chatham-Kent (65.6%) and Huron County (65.3%). The Brantford area (64.0%) and Lambton County (62.2%) were also right up there.